Language skills help kids and adults make friends, express their needs, share emotions and interests, and live happy lives! There are so many ways to use words, body language, and even sign language to ask for things and tell people what you want. As a former teacher of kids with communication disabilities, I think about language a lot! I watched as many of my students struggled with communicating and made it my mission to help families in this area. Many parents don't understand how kids develop language and they also don't know what kids should be doing, especially with their first child. When I was a teacher, I often co-taught a communication lab with the Speech Therapist at our school and I loved learning from her and using her strategies to help my students. 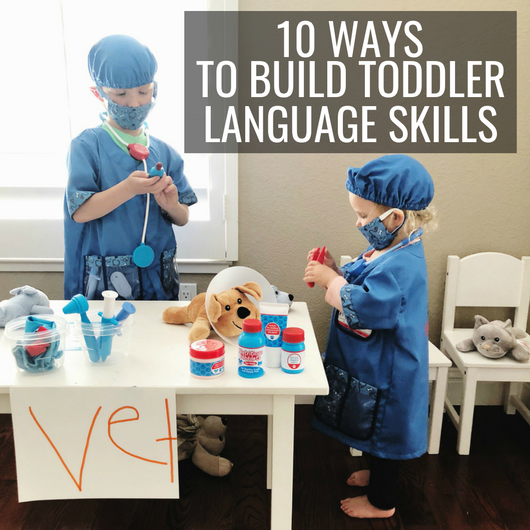 Although there are more in depth things that Speech Therapists can share, as parents, there are some really simple things that we can do to help our toddlers build their language skills. If you are worried about your toddler's language development even just a little bit, I always recommend seeking the advice of a professional. To get started, let's talk briefly and generally about toddler speech development between the ages of one and three. What language skills do toddlers actually need to develop? Below, you'll find language skills broken down into two areas: hearing and understanding and talking. Both are important and go hand in hand! If your child is under less than twelve months old, you can find information about language development here. There are probably a dozen or more things we could add to the lists above, but those are just a few to get started. Now, one thing to remember is that sometimes there is a difference between what a toddler has learned and what they can do. For example, my toddler can name pictures that I point to in a book, but sometimes she doesn't want to... ha! So be aware of that as well. Remember that toddlers all develop differently! Language develops at a different pace for each kid, even within these age ranges and skills. I like to use these Language Red Flags from my friend Katie who is a speech-language pathologist. Check them out if you are worried about your child. I especially want to highlight her suggestion NOT to wait and see until age three! If you are worried about your child's language development at any time, seek out professional help, whether they are 15 months or two or three! 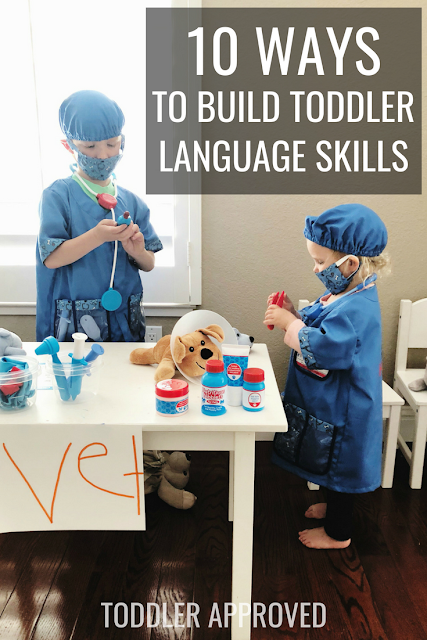 Now that we've talked about some of the skills toddlers are developing, let's brainstorm several ways that we can help toddlers build their language skills. How can we help toddlers build their language skills? These activities help toddlers increase their vocabulary and start to learn how to communicate with family or friends better. They also introduce kids to rhyme and rhythm. Read books, signs, magazines, box labels, menus! Anything! Kids are exposed to so many new words, phrases, and types of communication as they read books. They also can learn about things like opposites, figurative language, social language skills, rhyming, and so many other things depending on the books you choose. 2. Use photos and photo books to talk about special events, family, and friends. I just started taking photos from my camera roll to make simple Chatbooks. I write brief descriptions in them, but mostly they are wordless photo books to look through with my kids. 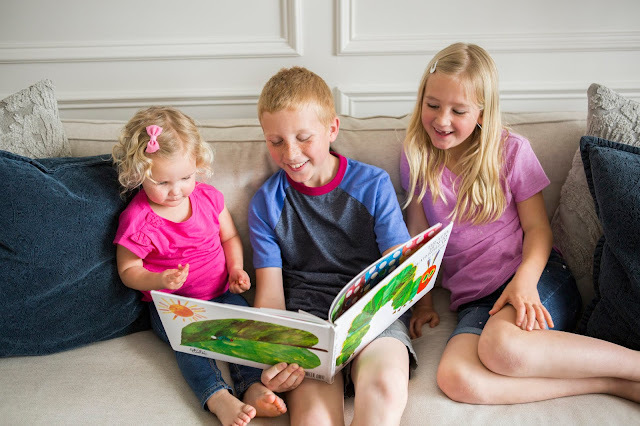 Often wordless books are even better than books with words because we tend to vary our descriptions and language each time we read them, therefore we are teaching our kids new words. We also love to create interactive photo walls and photo activities, like this photo garden and photo Christmas tree, to help kids learn names and talk about past events. Games that include photos, like making a photo memory game, can also be a great way to encourage kids to talk. We love to set up pretend play scenarios and put on costumes. 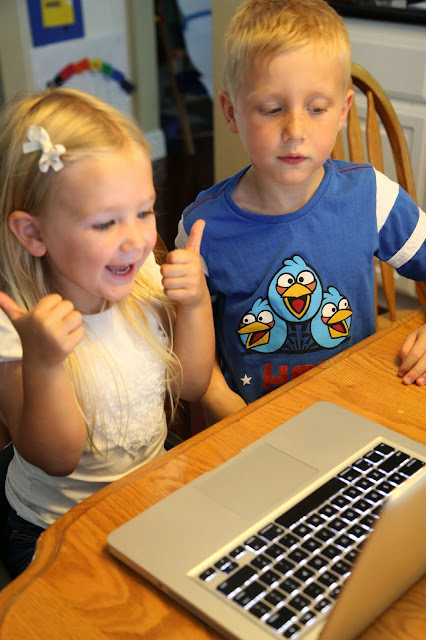 Kids naturally pick up new words and practice words, phrases, and sentences in these settings. 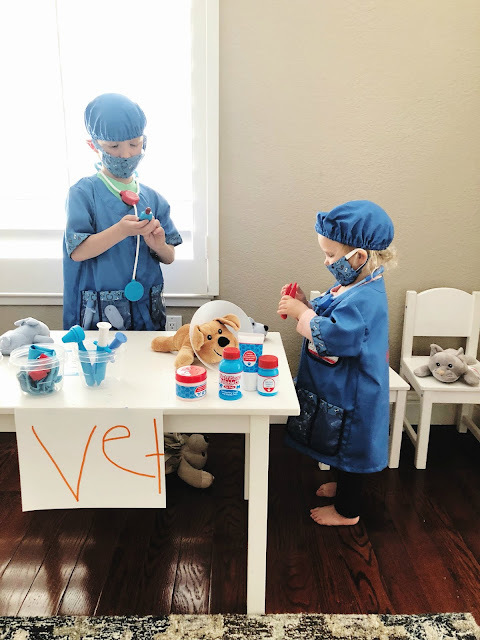 Setting up a pretend store is such a great way to practice conversational turn taking and even manners, Setting up a doctor's office or restaurant can also help your child build new vocabulary skills and help them start to string words together into sentences. I love to join in playing with my kids and model different types of phrases or statements that they could use! I always love when they use some of the language skills they learned during pretend play time, out in the real world! Technology used properly and as part of a social experience, can be a great tool for families. As mentioned later in this post, watching baby sign language or downloading an app to help with that can be really helpful. Also, some very simple apps can be downloaded onto phones so that kids can play with them and also have parental guidance/support and learn to follow directions, understand new words, and practice. One of my favorite ways to teach toddlers their body parts is through songs, books, and using movement. You can also talk about their body parts naturally during daily activities as they come up- changing diapers, taking baths, washing hands, etc. Nursery rhymes are great for building language skills because they provide a great foundation of vocabulary words! The rhythm of the words in nursery rhymes helps your toddler's language memory skills too. My friend Anna at Measured Mom shared a few other benefits to learning nursery rhymes here. I think they are critical things for toddlers and preschoolers to be learning! We have the best set of Scholastic mini nursery rhyme books that my kids love to read. 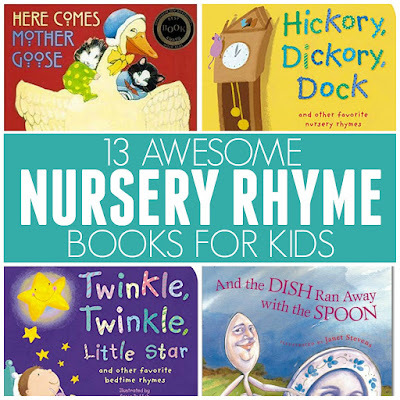 You can find 13 of our favorite nursery rhyme books here. Have you taught your kids any sign language? When my oldest was little, he loved the Baby Einstein First Signs video that we would watch together. It is really simple, but he learned how to say "more" and "milk" and "drink" and "all done," etc. These signs were really helpful as he grew and tried to communicate, but sometimes couldn't express exactly what he wanted! As I used the sign language and said the word out loud too and he copied me, he often also remembered the words better and started picking them up faster. A lot of his frustration was alleviated because he could tell me what he wanted. Getting moving and talking is one of the best ways to learn new words and chat with your little one. 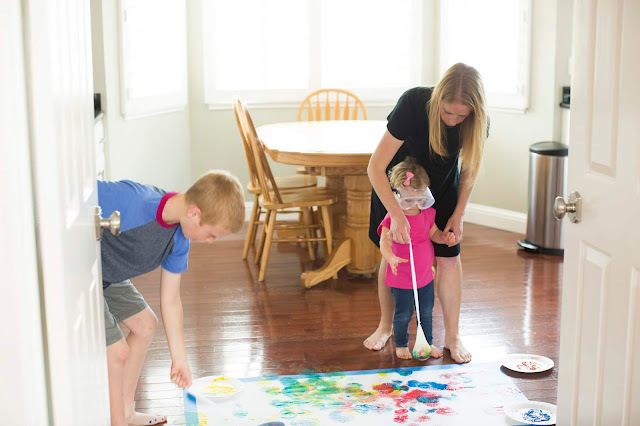 We love hunting around the house for things and have a different hunt activity for every holiday or theme. When you hunt around the house with your kids you are not only modeling different new words, you are repeating familiar words (thus reinforcing them) and you are using directional and positional words like up, down, around, behind, on top of, under, etc. These words are critical for kids to learn as they start expanding their own language and learning to follow and give directions themselves! Who knew that simple activities like hunting for toys around the house could be so beneficial and fun at the same time? You can never underestimate the power of connecting with your toddler and creating together! Not only are you able to build a great relationship, but there are so many opportunities for talking and learning and teaching in natural settings. While creating, kids learn to follow directions or make their own directions and explain them to adults. They also learn the names of the materials they are using and begin to be able to understand what each item is used for... and over time can teach that to others (ie. the stamps are used like ___ or to make roads we roll out the painter's tape like ___). The emotional connections that are made during creative activities can also help make language/conversations stick in memories longer than if kids were doing activities alone. The relationship building is so important and parents or other mentors can be such great language models for kids! Do you do any of these things with your toddler? Which are easiest for you? Which ones are harder? Do you have any additional suggestions for helping to build toddler language skills?